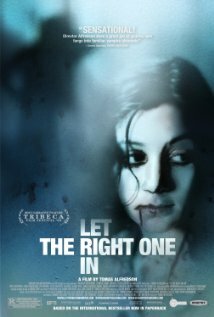 Our must see foreign films recommendation for the week is Let The Right One In from Sweden. Oskar is a loner and is the favourite subject of school bullies. He has fantasies of violent revenge but never had the guts to do put do it. Then a girl moved in next door, Eli. Both social recluses, Eli and Oskar form a special bond despite their vow not to become friends. Things start going well especially when Eli gives Oskar the courage to fight back against the bullies. And then violent attacks and murders start terrorizing their town. Oskar can't help but wonder if his new friend has anything to do with it. Don't forget to visit Amazon for a DVD copy of Let The Right One In and Other Must See Foreign Fillms. Let The Right One In is visually and narratively cool and hot, timidity and passion, strange and common, remarkable complication and astonishing simplicity. Half of the story is told visually. The snow envelopes many of the scenes that is in exact contrast with the dark nature of the characters. The cinematographer frames it well so that the smallest speck of darkness is highlighted against the screaming purity of white. You will also be able clearly see the stillness and environment in the scene. It’s a chilling stillness, like the sound of death which makes every single movement more valuable and more meaningful. In scenes of Eli and Oskar, there was an astounding simplicity. Everything around them was always at its bare minimum. It directs your eyes and all of your concentration on the two characters. It allows you to look at them deeper, beyond the color of their skin. Like many of our must see foreign films recommendations here, the movement of Let the Right One In's story complements the visual direction. The conflict seems simple in the beginning. It was just about this boy who is being bullied and then him finding a new strange friend. But as the story moves, the characters reveal the aggravation and pain of the alienation they have been suffering. Their life is full ironies – nobility in damnation, strength in emptiness, love in death. Both have no parents. Hers are dead and his are emotionally remote. Both have no friends. One bullied, the other can’t possibly have friends. I never thought that I’d find a vampire movie that rises above the clutter of all the other vampire movies and shows being produced like they’re milking a cow. But Let The Right One In proved to be a movie about the agony of ironies whose characters happen to be vampires.